The Logan County Area Chamber of Commerce would like to recognize Marmon Valley Farm as December’s Business/Entrepreneur of the Month. Marmon Valley Farm is an agri-tainment farm park that welcomes families and groups of all ages to come out and visit the farm. They invite visitors to come out and visit the barnyard animals, enjoy a trail ride and experience a taste of farm life. 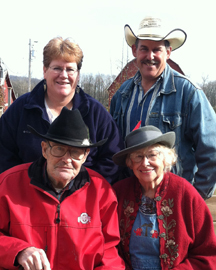 The farm opened 49 years ago by (William )“Uncle Bill” Wiley and “Aunt Phyllis” Wiley. Uncle Bill’s dream was to open a farm camp for children where they could experience “real” farm life for a week. The early years emphasized farming, gardening and small animal care. However, it didn’t take long for the horse program to take off after being introduced on a much smaller scale than you see today. The summer staff of 1964 consisted of 4 staff members. As word about Marmon Valley spread and the Wileys worked hard to serve the increasing number of guests, the need to expand both the camp and the riding stable presented its self. The mid seventies also brought about new goals for Marmon Valley Farm as Uncle Bill and Aunt Phyllis decided to develop a stronger Christian emphasis in the camping program by presenting the gospel of grace through faith in Jesus Christ to all campers who attended. As the Lord blessed, the camp grew in size and attendance. An all-purpose activity barn was constructed in the late seventies, as well as, new housing facilities for campers and guests. Another land purchase brought the farm’s total acreage to its current size of 500 acres. Family members Matt & Kathy Wiley along with their five children, Becca Adelsberger, Daniel Wiley, Lizzy Wiley, Joel Wiley, and Josh Wiley; and Steve & Jane (Wiley) Olsen and their children Luke and Tim Olsen are all involved in the family business. The farm offers a variety of activities including summer camps, a riding stable and retreat center, horseback riding, hay rides, a climbing wall, challenge course, petting zoo, picnic areas, hiking trails, and fire rings. Bill and Phyllis Wiley received the citizen of the year award from the Zanesfield Chamber of Commerce in 2010 and Matt Wiley received the same award in 2012. Bill and Phyllis Wiley received the Lifetime Achievement Award for Christian Camp & Conference Association Ohio Section in 2012 and the Lifetime Achievement Award from the American Camping Association Ohio Section in 2010. For more information about Marmon Valley Farms contact the office at 937-593-8000 or email info@marmonvalley.com. Be sure to visit their web site at www.marmonvalley.com and also “like” their Facebook page. Please join us in thanking Marmon Valley Farm for their continued support of Logan County! !